The last Beginners’ Class for the Arena Fitness Dojo this year of 2014 will be starting tomorrow, Saturday, Nov 8. All the participants from the October Trial Sessions are invited to comeback to the dojo tomorrow to sign up for the class. Please be reminded however that we will only be accepting 15 students, so the earlier you arrive the better your chances of getting a slot. 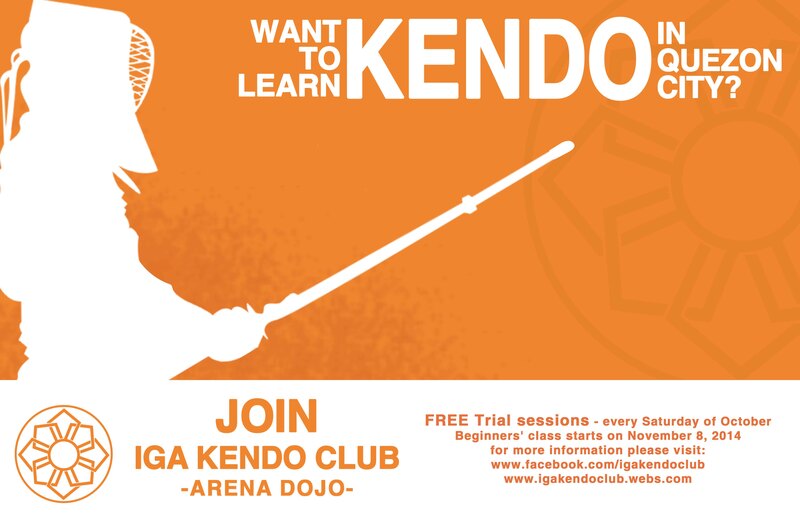 For those who are still interested in joining the club, the next intake for the Arena Dojo should be in February-March of 2015. Or you can still join via the Dasma Village Dojo in Makati. This entry was posted in IGA-Ken News, Recruitment and tagged Arena Fitness Dojo, Arena Fitness Inc, beginner, Dasma Dojo, Dasmariñas, dasmarinas village, Iga ken, Iga Kendo, IGA Kendo Club, kendo, Makati, Quezon City, training. Bookmark the permalink. ← Oshaberi Salon Part 2!